the API function WSAGetLastError always returns 0 (zero). This is caused by the fact that TD internally resets the last error code so your code will not be able to get it. A solution is to use a wrapper dll, which offers the same API as WinSock, but internally calls WSAGetLastError when an error occurs. 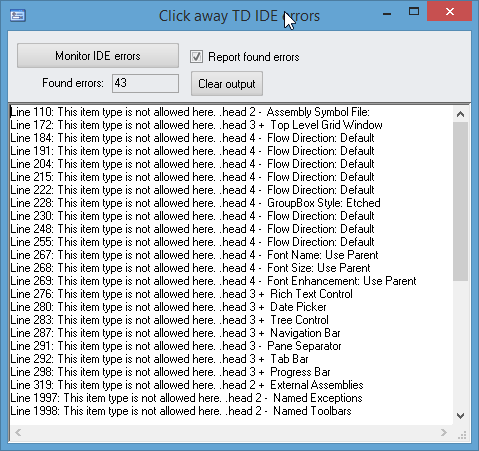 The fetched error code is then passed back to TD so you can display the detailed error info. A small wrapper is build and can be downloaded from the Sample Vault which does the above. The source (Visual Studio 6 C++ project) is also part of the ZIP file. Along with the TD sample, a INI file is present which holds all WinSock error codes and their short and long descriptions. The sample application uses this INI to display the detailed error message. within your TD application. Without the Callback DLL principle, TD does not offer a way to support callbacks. The Windows API function EnumThreadWindows is able to enumerate all nonchild windows associated with a thread. This means you can obtain all opened top level windows within your application (all other windows present in the system take no part in the enumeration). the handle to each window, in turn, to 'an application-defined callback function'. So, by calling this function and passing a "pointer" to an application defined function, all window handles are passed to that function in sequence. As TD does not support pointers to functions, you are not able to utilize this function. which can be used as callback function. TODO: create a callback sample on EnumThreadWindows. All credits and thanks go to Armin Pokorny, who has developed this handy tool !!! This tool adds for every function and message within your TD source a trace option. 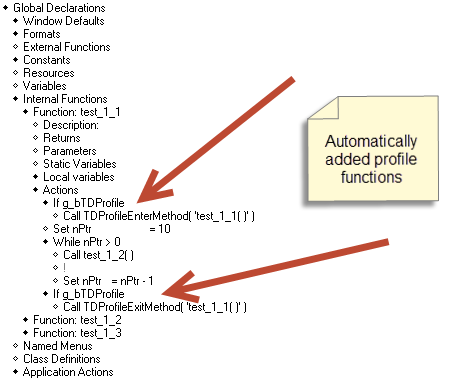 When running the profiled application (and tracing is enabled), the entry and exit of the profiled functions/messages are saved to a trace file. Using the trace viewer, you can inspect which functions are called and what time it took to complete the function/message. This tool will add the needed extra code in your source. Every function/message entry and exit points will be changed to have the entry and exits in the trace file. The resulting source file can be used to build a profiled application. When the profiled application saved a trace file, use this tool to view the trace file. TDProfiling.dll -> manages saving to the trace file. 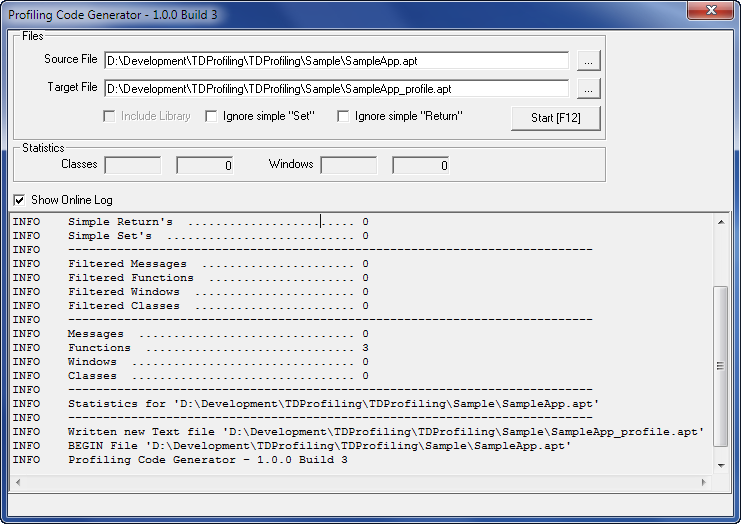 It is a custom build dll, the project of that dll can be found in folder TDProfiling_dll. This dll must be deployed along with the profiles TD application. 3) Press Start. It will create a profiled source. Repeat for every source file you want to trace. 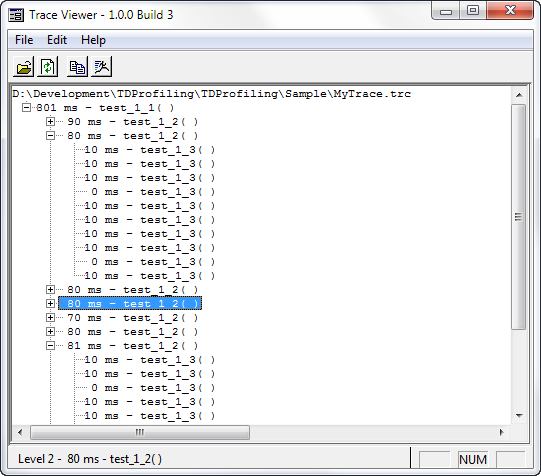 9) Use the TDTraceViewer to open the trace file and inspect. UPDATE : Version 2 build 1 is now available. It is a stripped version, backported to TD15 file source. This means you can use it with TD15 and higher without changing the source includes. With this library you can access the Windows registry using a class with functions to read, write or delete registry items. The original library (v1.4) was only for ANSI TD versions and was not updated anymore in a central place. The original library was created by Joe Meyer. Now a new archive is created, starting as v2.0. It offers both ANSI and UNICODE versions. ANSI must be used for TD1.5 up to TD4.2. UNICODE must be used for TD51 and higher. Also some new functions are added. For instance the feature to dump parts of the registry to a file or as a string. Some defects have been solved on the older functions. The purpose of this library is to give a simple tool to encrypt string in a simple way using standard of encryption today. For TD 6.2 and higher. 3. Select Crypto.Security Class and choose the output path to generate the proxy Class. sha1Encrypt The first parameter is the String to encrypt in SHA1 algorithm, the second value is the encrypted string. Returns a boolean true if succeed or false if failed. sha2Encrypt The first parameter is the String to encrypt in SHA2 (512 bits) algorithm, the second value is the encrypted string. Returns a boolean true if succeed or false if failed. SimpleEncrypt The first parameter is the String to encrypt in Rijndael Algorithm with a pass key and initvector defined as constant in the library. the second value is the encrypted string. Returns a boolean true if succeed or false if failed. ComplexEncrypt The first parameter is the String to encrypt in TripleDES Algorithm, the second parameter is the passkey specified by the user, the third parameter is a boolean if true use a MD5 hashing of the key, the fourth value is the encrypted string. Returns a boolean true if succeed or false if failed. ShowLastError Return a string with the last error of the instanced class. When you want to open sources created in a newer TD version using an older TD version you will have to manually change the outline version number in the source file. You are then able to load the source. But in many cases the outline structure of the source contains items which were introduced in the newer TD version(s) and can not be processed by the older TD version. There is no option to dismiss them all and ignore any errors which might be encountered. Pressing CANCEL on the message-box will cancel the loading of the source file entirely. For large sources having many issues this manual action is very tedious and time consuming and will probably induce RSI. Furthermore, when you want to know which errors occurred, you will have to write them down for each case. Logs all encountered error messages in a string field to be used for inspection later on. 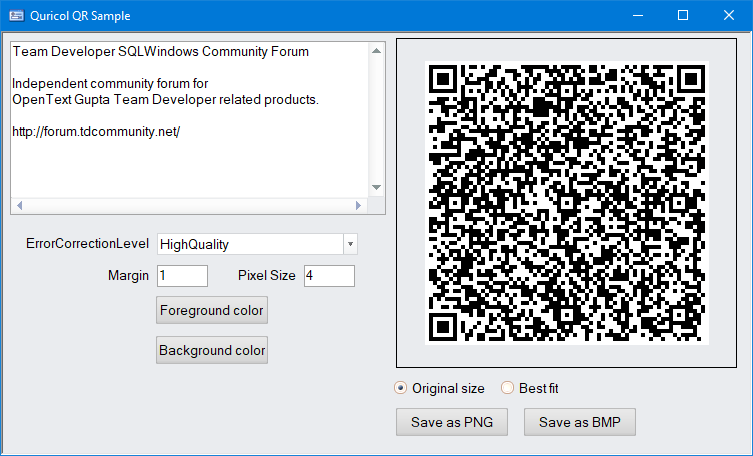 Quricol is an open source freeware QR code generator library for C++, Microsoft .NET and Delphi based on qrencode – QR Code encoder by Kentaro Fukuchi. The library contains methods to save the generated image to Bitmap or PNG file or generate images on-fly and save it to the stream. The Quricol library can be used in TD applications using the supplied API for ANSI and UNICODE TD versions. Also a 64 bit version is available for TD 7.x x64 versions. The TD implementation is shown in a sample application. QR code is generated and displayed in a picture control. The margin, pixel size and quality can be set. Furthermore, the background and foreground colors can be changed. The resulting QR code can be saved to a BMP or PNG file on disk. It contains sources for ANSI, UNICODE and x64 TD versions. This page was last modified on 9 January 2019, at 13:58.